Our famous Personalised HB Pencil sets are now available with a whole heap of different font and icon choices – so your pencils can be totally unique. First choose what colour pencil barrel you would like (the barrel is the outside – lead inside is HB), then the font colour (Gold or White), then select your font style, and then finally an icon for the pencil (if you want one). We can also do your company logo if you would like – any size run is fine! 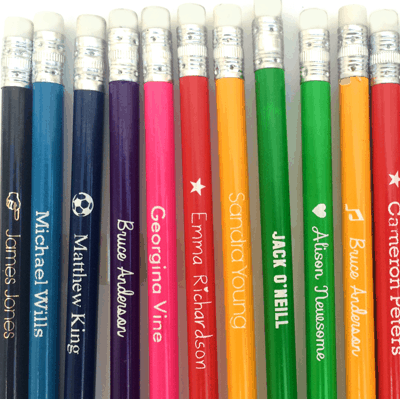 Our famous Personalised HB Pencils are now available with a whole heap of different font and icon choices – so your pencils can be totally unique. What icon would you like?